I have recently come to the conclusion that my life at sea can be summed up fairly succinctly by these two comics from xkcd: To be Wanted and Far Away. That’s not to say I don’t love my career, I couldn’t imagine doing any other job (and I’ve tried a few). Not for me the daily grind of the office, or the servitude of retail, no. It’s not a constant joy, but the moments of sheer poetic beauty that I get to occasionally experience are enough to remind me that I could never be happy anywhere else. I’ve loved being on the water from an early age, we had a mirror dingy that we’d take on family holidays to the lake district, until the fateful holiday that we took in Wales when we pulled it up onto a rocky shore and holed it. We still have it, waiting for repair in the shed at home. When I got a bit older, I did a couple of trips with the Ocean Youth Trust, going as far as the Channel Islands and buying my first half pint of cider in a pub at the age of 12 or so (I have no idea how I pulled that one off!) 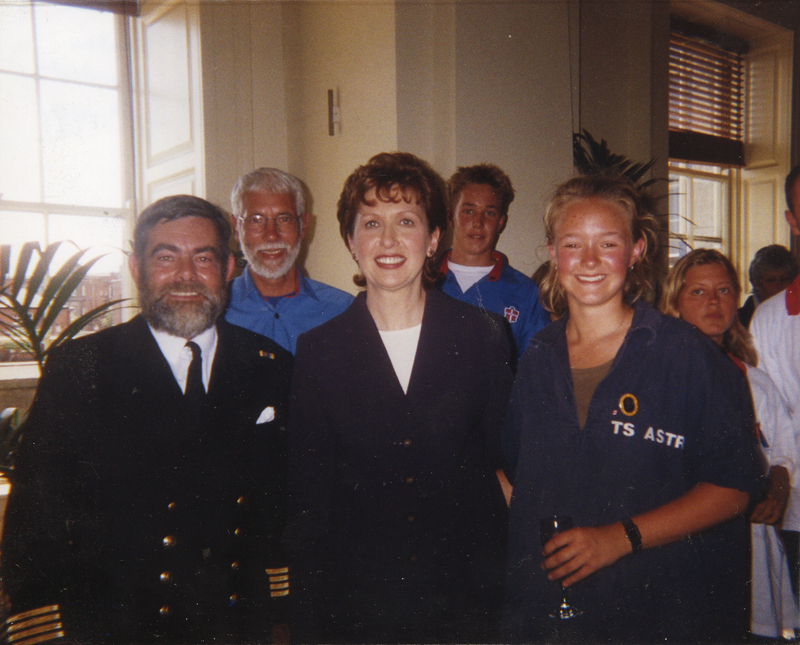 But I first sailed on a ship at the age of 13, a day sail on a Tall Ship based in Dorset called TS Astrid. I remember getting them to let me climb the mast and waving down at my mother on the deck, she had palpitations, but I was hooked, and as it turned out so were they. They did a trip to France and then they got the chance to go to the Caribbean on her for three months, leaving me and my sister at school. Dad then continued to volunteer for them, which lead to increased levels of jealousy on my part. After much badgering, when I was 15, I got my parents to allow me to do a short trip to France on the Astrid with my Dad. It was, essentially, a booze cruise but my mother reckoned I wouldn’t be able to get into too much trouble with my Dad looking after me. He left me to hang out with the (gorgeous and very gentlemanly) men in their 20s while he hung out with the guys his age. It was heavan, and not just because of the lovely men who bought me cider in the pub and champagne in the supermarket. A year later, in the summer between my GCSE’s and A-levels, I spent the entire holiday on board, joining at Weymouth to help take the ship to Falmouth for the start of the 1998 Tall Ships Races. We raced from there to Lisbon, took a leisurely cruise to Vigo, with several stops and parties along the way, and then raced to Dublin. The day before we arrived in Dublin, we heard the news about the Omagh bombing, which had shaken the whole country deeply. We still celebrated the Tall Ships, but also made sure we shared as much love and empathy as possible with the people of Ireland. 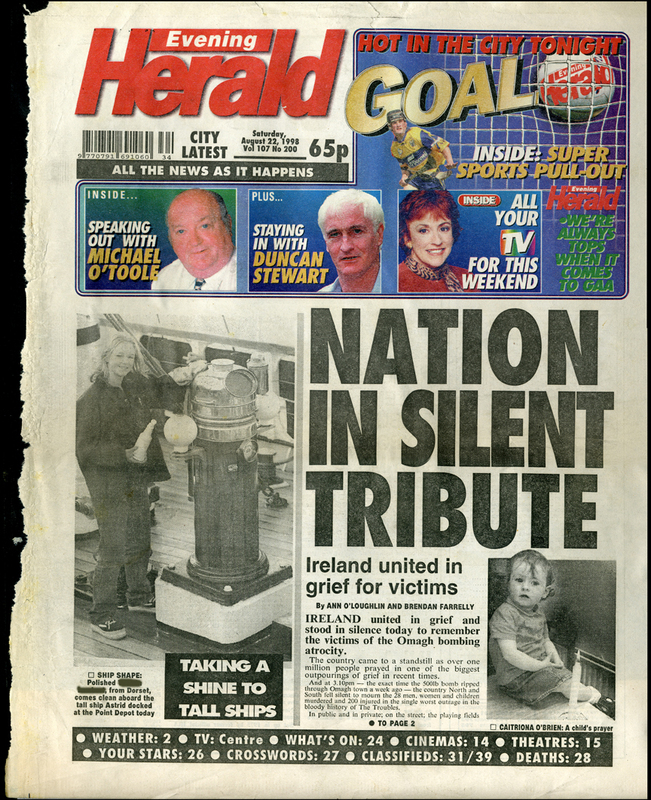 One morning I was standing on the poop deck, polishing the binacle to my usual mirror-like standard, when a photographer passed by and asked if he could take my picture for the paper….. and that is how I came to be on the front page of an Irish newspaper next to a massive headline about the Omagh bombing. The other truly memorable moment from that trip was at the end of the parade: I was wearing my salt stained and well worn Astrid smock, my hair bleached by the sun and sea in a messy bun, our Captain was in his Merchant Navy finest uniform. When we arrived in the square at the end of the parade for the prize giving and speeches he told me to come and sit in the front with him, we were going to get a prize. I took it that I was the “token crew member” who always goes with the Captain, but he was very firm as he said this: “No, you go up first. You collect the prize. You’ve earned this.” Mary Mcaleese, the President of Ireland, was giving the prizes out, I felt like a total scruff bag! We were presented with a beautiful sliver tankard, the prize for the ship and crew that had done the most to promote the spirit of the Tall Ships (we threw the best parties!). As we left the stage I was handed a slip of paper inviting us to a champagne reception for the prizewinners, and then turned to the Captain to give it and the tankard to him – his ship after all! “No” he said, “That’s yours. Now come on, we’ve got champagne to drink, and then we’re going to go and christen that properly!”. I keep in pride of place the photo someone took that afternoon, of him, myself and Mary Mcaleese at the reception (I had no idea of proper etiquette and put my arm around her). I look like the happiest little urchin alive. Believe me, it felt like a lot longer!